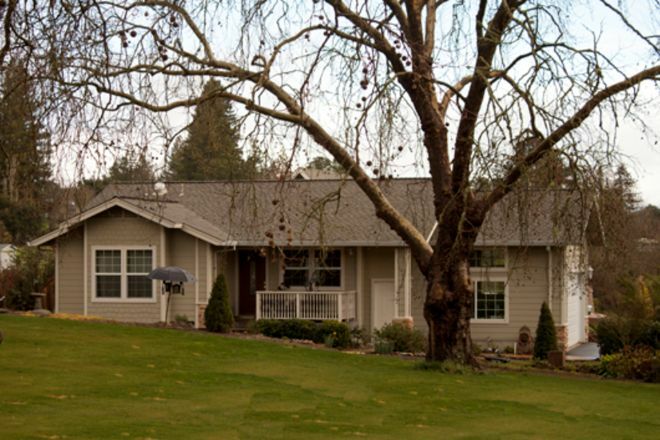 There is something so appealing about a country ranch style home - it just seems cozier somehow, more down to earth. 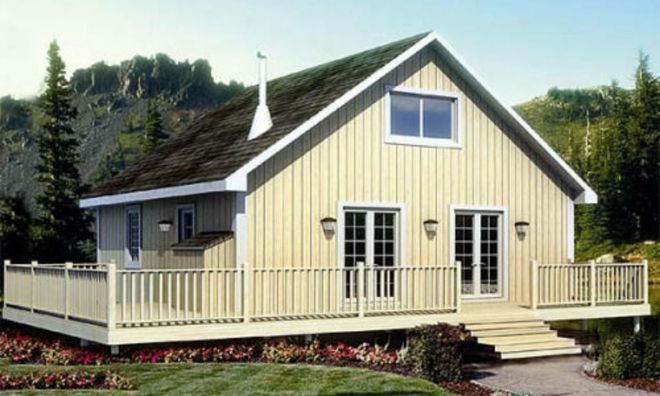 If you love the rustic look but are worried it won't translate into a tiny house, check out our selection below to see that your country ranch tiny home dreams are possible. This 984 square foot (91.4 square metres) property has an open-plan kitchen and living room with double height interior to add an airy feel. 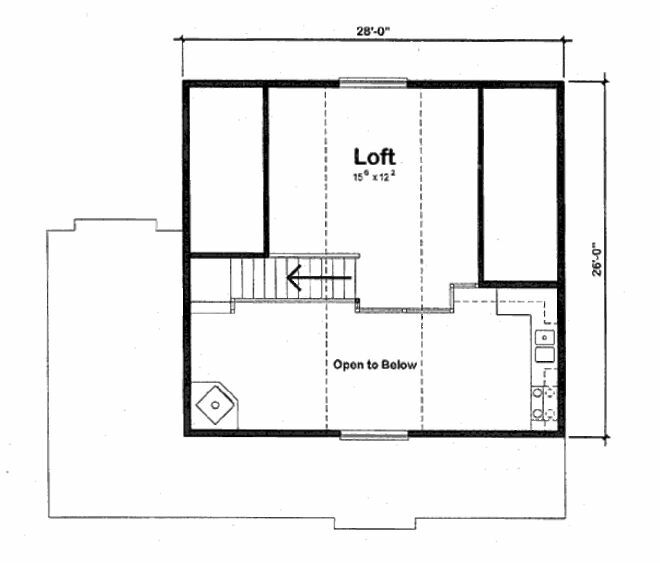 The loft on the first floor is ideal for storage and makes use of the eaves of the house. The outside decking area adds another 378 square feet (35 square metres) to the usable space, making it perfect for a corner property or directing towards a particular view. The deck is ideal for grilling on a hot day. Inside, the breakfast nook provides an area to chill out in if it's raining. 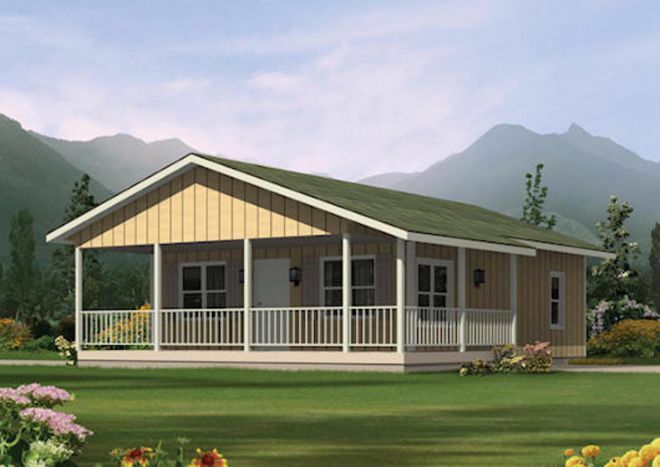 Ideal for a small family, you can put the kids on one side of the house with their own bathroom, while Mom and Dad get the master bedroom and ensuite. All beds lead out into the central portion of the property, which has an open-plan feel for the kitchen, dining and living rooms. 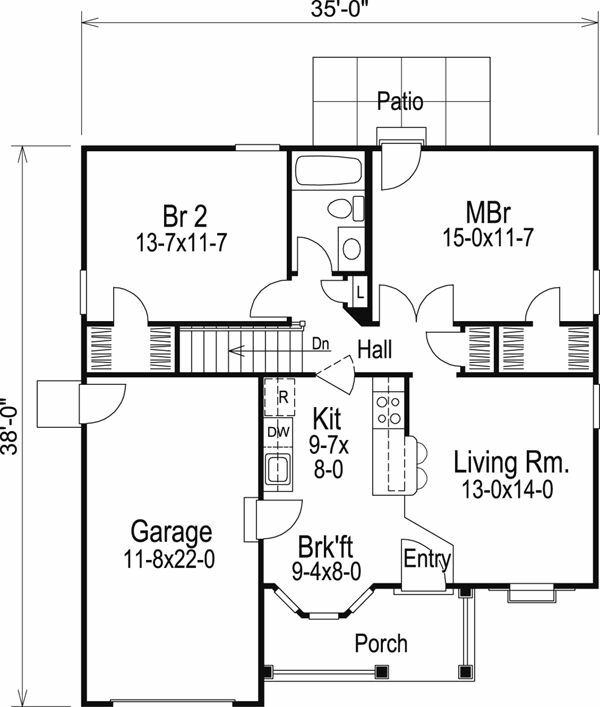 Built-in closet space keeps storage neat and tidy and the included garage has two carports. 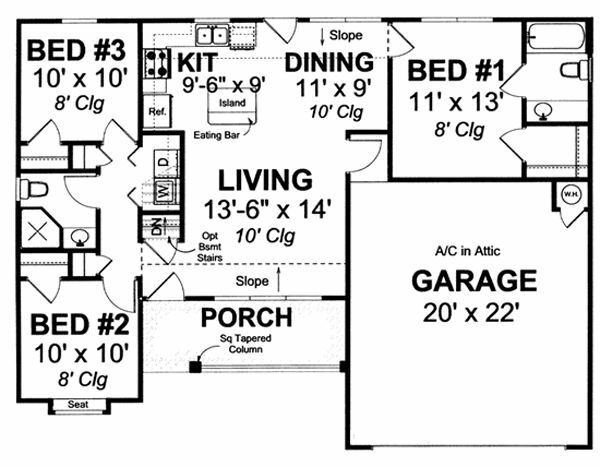 At 998 square feet (92.7 metres), this floor plan is just under the limit for a tiny home, but can be modified to include a basement if required. At 720 square feet (67 square metres), this property is well-consolidated to provide comfort and efficiency. 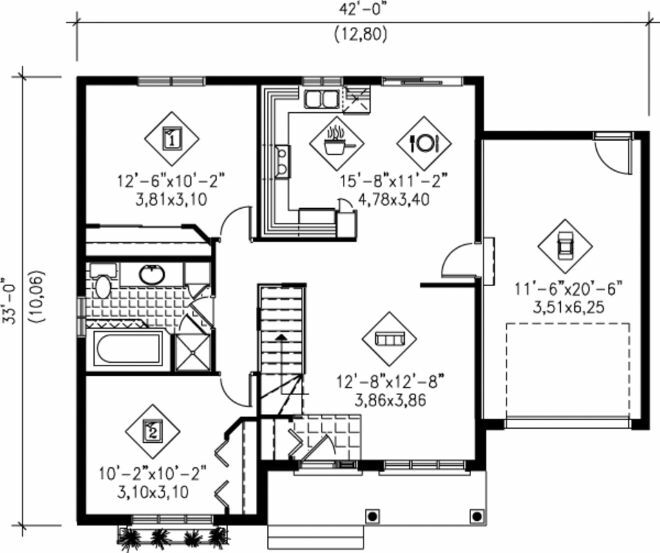 An open plan kitchen-diner leads to the living area, with the single bathroom and laundry room centrally located and accessible from the two bedrooms, each with built-in storage facilities. The covered wrap around porch provides extra living space rain or shine and is perfect for a cookout or a couple of lounge chairs for taking in the view. Large square windows maximise the natural light entering the house for a bright, cheery interior. 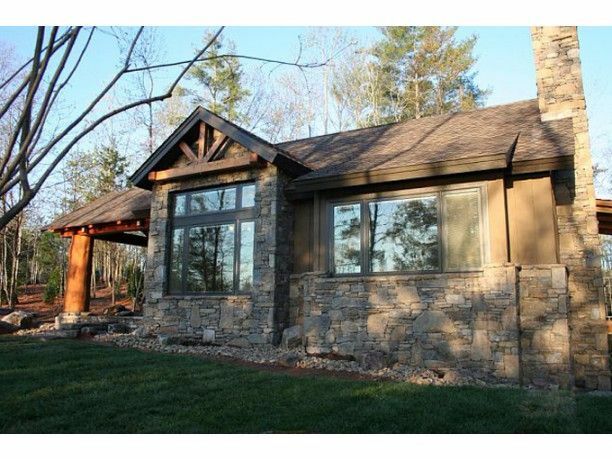 This delightful cozy cabin comes in at 681 square feet (63 square metres) and would sit beautifully on a woodland plot. The open plan living space is complemented by large windows to let in light and a lovely fireplace for evenings in. Enter from the spacious porch to find the kitchen, dining room and living area down the entire length of the building, while two double bedrooms with ensuites take up the other half of the property. The modifiable plans allow you to customise the build to your preference as well. At 480 square feet (45 square metres) this tiny home is perfect for a couple, with the double bedroom leading out onto the covered porch. 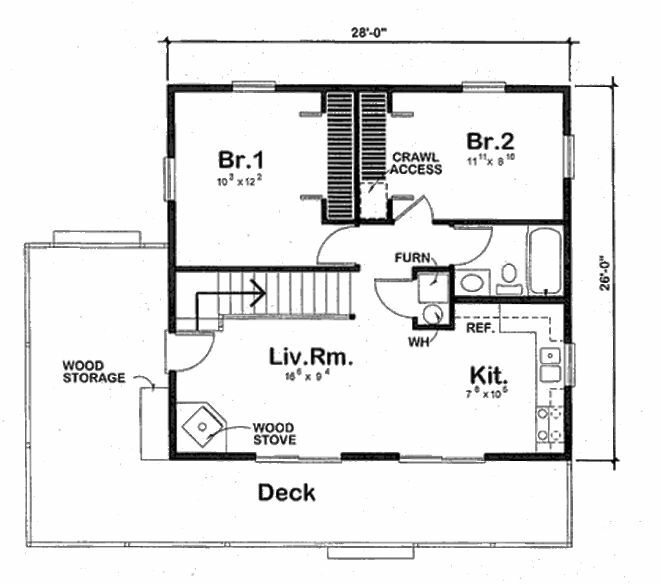 A mudroom with laundry facilities and access to the bathroom from outside as well as inside makes this building ideal for outdoorsy types. The open-plan kitchen, diner and living space can be extended outside as well, onto a covered patio and in foul weather the fireplace provides a focal point to cozy up in front of. 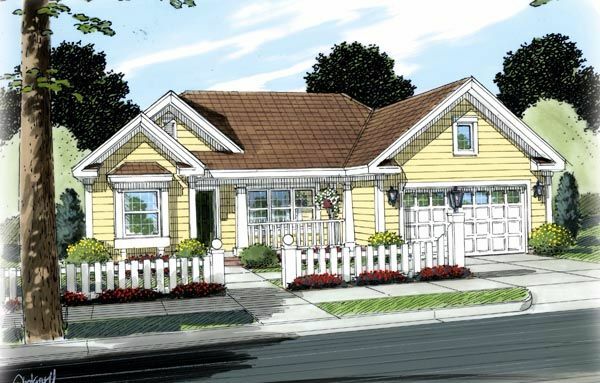 The garage included in the plans parks one car and provides additional storage space. This 840 square foot (78 square metres) property is beautifully laid out for a small family or a couple that enjoys entertaining. 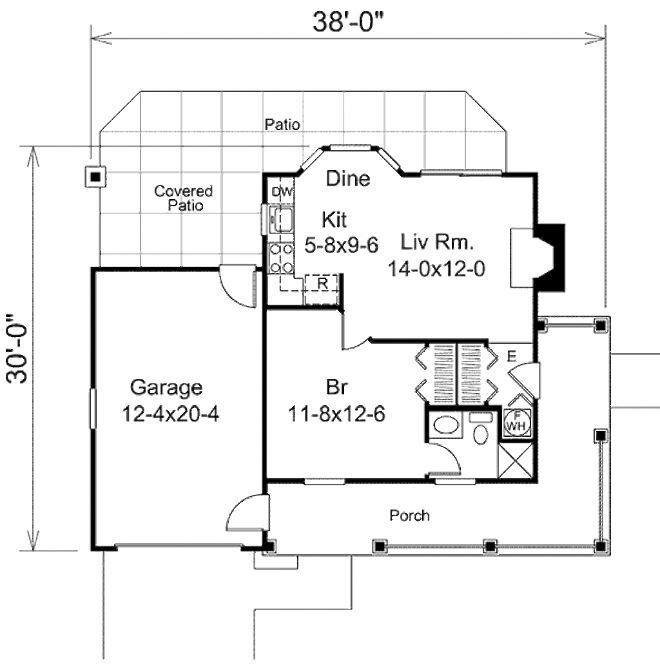 The two car garage provides storage space and is accessible from either end of the house. 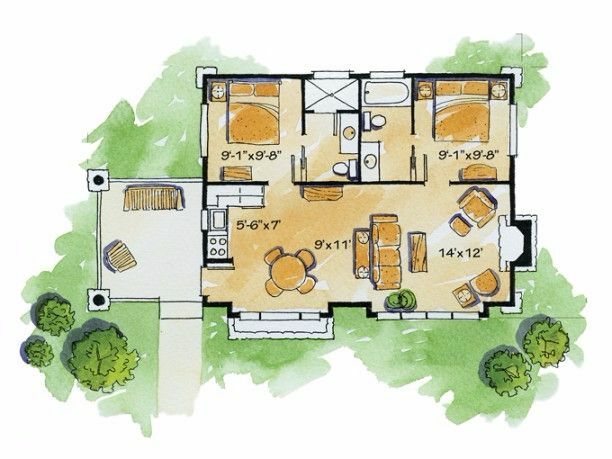 A sundeck and a covered porch allow you to spend time outside whatever the weather and extend the living space. The open-plan kitchen, diner and living area is definitely the heart of the property, leading off to the two bedrooms and bathroom. 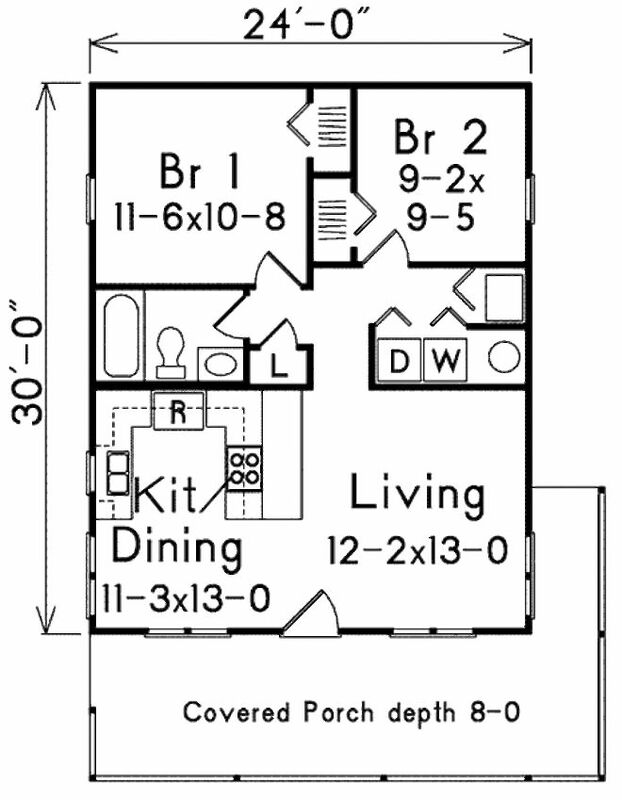 Each bedroom has built-in storage closets and space for a double bed. 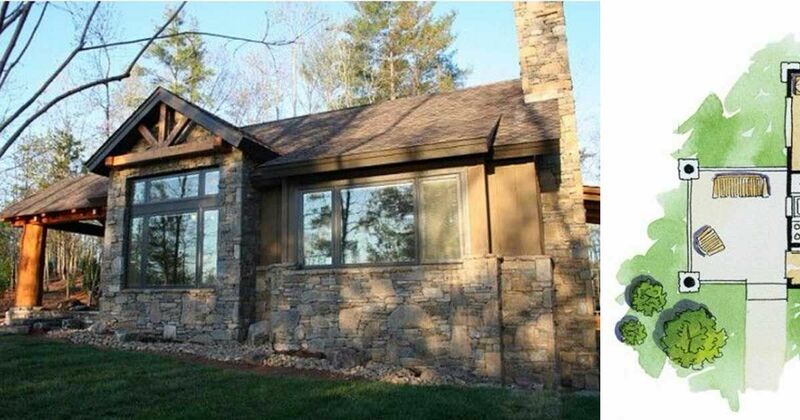 This 888 square foot (83 square metres) property is ideal for a four-person family or outdoorsy couple. 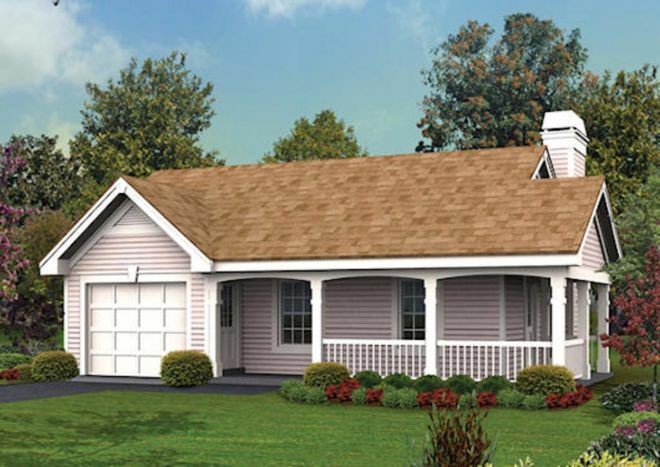 With a single carport, you can enter the house from either the garage or the covered porchway. A compact kitchen makes way for a cozy breakfast nook, then leads round into a spacious living room. The hallway takes you to the two double bedrooms and the bathroom. A private patio is accessible from the master bedroom to soak up the view. You can optionally build on top of a basement, the stairs for access to such in the hallway. 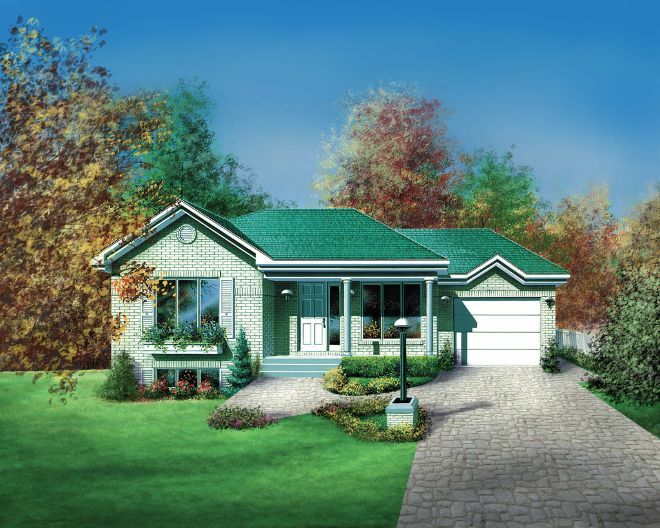 This ranch style home comes in at 919 square feet (85 square metres) and is well-suited to a sloping or narrow lot. 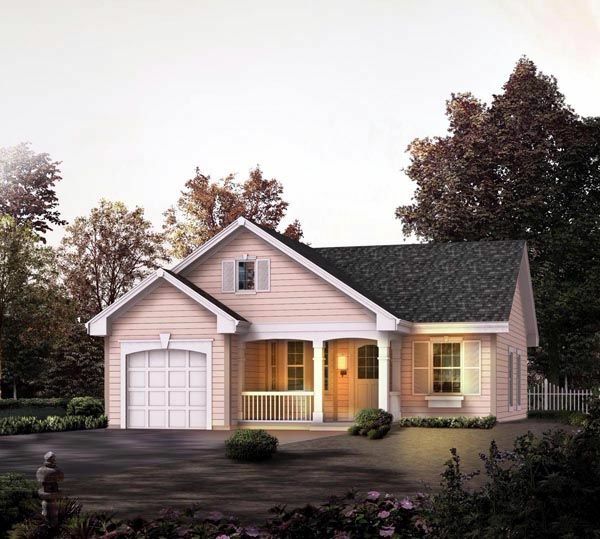 Enter through the covered porch to the open-plan living, dining and kitchen area, or park your car in the attached garage and enter to the kitchen. 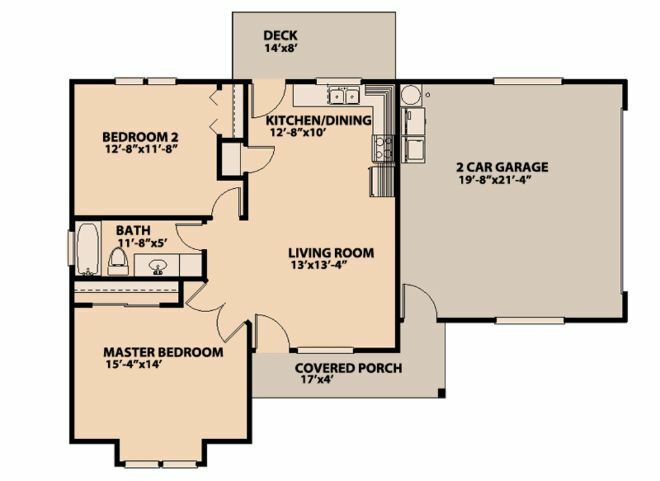 You can build the property atop of a basement, accessible from the living room and dividing the open space to create a hallway leading to the two bedrooms and bathroom.